I remember my first dive clearly, gradually sinking to the bottom in three hundred feet of water. As the bottom approached, the water cleared and in the dim light I could make out white objects covering the seafloor. Suddenly, we landed and the submersible’s pilot turned on the outside lights. Wow! We were surrounded by corals, sponges, and feather duster crinoids, carpeting the rolling landscape as far as the eye could see. This first encounter with deep-sea corals was on Heceta Bank in 1988, forty miles off the Oregon coast, hardly a place that fits the classic image of a reef basking in sunlight under clear tropical waters. Corals, though, are world-wide in distribution and are quite common in both shallow and deep oceans as well as warm and cold seas. Unlike corals in shallow tropical waters, cold-water deep-sea corals and their associated communities are relatively unexplored. In the last few decades, however, we have begun to learn a great deal about these fascinating communities, their unique role in sustaining healthy fisheries, and the serious threats they face from human impacts. Deep-sea corals may form reefs that are both impressive and diverse. These reefs, in turn, provide habitat to many other species and are important for productive fisheries. Hydrocorals and strawberry anemones, photographed by Victoria O’Connell. Corals are classified in the phylum Cnidaria (from the Greek word knide, or “stinging nettle”). We currently know of dozens of species in several taxonomic groups, including stony corals, black corals, gold corals, hydrocorals, and gorgonian corals. Like their tropical counterparts, deep-sea corals comprise solitary or colonial anemone-like polyps supported by external calcareous skeletons. Individual polyps harvest plankton and other nutrients from seawater using stinging cells. Because they feed on food-laden ocean currents, they are often found in habitats that exhibit very specific combinations of substrate, ocean currents, sedimentation rate, temperature, and salinity. Although corals are animals, they are often mistaken for plants due to their sessile habit and bushy or tree-like shapes. Large aggregations of corals may resemble small forests or thickets. Some coral colonies may exceed fifteen feet in height and form extensive deep-water “coral gardens.” These are often associated with large numbers of fish and other marine life, as evidenced by the schools of small juvenile rockfish—a commercially important species that uses these areas for nursery habitat—that I saw among the corals and sponges on Heceta Bank. Deep-sea corals inhabit the deeper continental shelves, slopes, canyons, and seamounts of the ocean at depths anywhere from 160 feet to 10,000 feet. For this vast area of the ocean, our knowledge is extremely limited. Although recent advances in seafloor mapping and submersible technology have permitted scientists to begin to locate and map the distribution and abundance of deep-sea corals, research efforts in deep-water environments are extremely costly and logistically difficult, so individual research missions typically cover small sites. Still, we have learned that deep-sea corals are both ecologically important and vulnerable to a wide variety of threats from human activities, and as such are in dire need of coordinated conservation efforts around the globe. Of course, one major reason why deep-sea corals are so important is the ability of some species to build reefs, features which may include other invertebrates such as sponges, feather dusters (crinoids), basket stars (brittle stars), and anemones. Taken together, these “structure-forming” invertebrates may serve as important habitat for a wide variety of marine life, especially fishes. In addition to shelter, these structures may improve feeding habits and provide critical breeding grounds and nursery areas for vulnerable young fish. In Alaska, a study by Bob Stone of the National Oceanic and Atmospheric Administration (NOAA) has shown that 85 percent of commercially important fishes and crabs were observed in association with corals and other structure-forming invertebrates. In the Atlantic waters off the coast of the southeastern United States, coral structures have trapped sediments that, together with the skeletal material of dead corals, have formed reefs 80 feet high at depths of 1200 feet below the surface. A study in 2006 by John Reed of the Harbor Branch Oceanographic Institute found these reefs to be occupied by 58 species of fish and more than 140 species of invertebrates. Gorgonian soft corals offer shelter to rockfish. When damaged by fishing trawls, they may take a century to grow back. Photograph courtesy of Ed Bowlby, NOAA. Back in 1988 when we took that first dive to Heceta Bank, the principal creatures of interest for the research cruise were fishes, with deep-sea coral communities as just a piece of seafloor “habitat.” Those of us with an interest in the corals almost had to be stowaways in the submersible. Fourteen years later, in 2002, I returned to the Bank for a new series of dives. However, this time the corals and other invertebrates were on an equal footing with fishes—recognition that damage to deep-sea coral communities was a key element in recent failures of the Northwest groundfish fishery. Our team’s research focus was now on how fish and benthic invertebrates live together and how these deep-sea coral communities form essential fish habitat, the holy grail of recent conservation efforts. The last ten years have seen a growing scientific and political interest in deep-sea coral communities stemming both from our increased understanding of the importance of these ecosystems as habitat for fishes, and from their high vulnerability to human impacts. Many deep-sea corals—particularly gorgonians, black corals, and sea pens—are slow-growing and long-lived. Gorgonians in Alaska may be one or two centuries old by the time they reach six feet in height; a colony of gold coral in the Bahamas was estimated to be 1800 years old! These ancient animals are especially vulnerable to mobile fishing gear: bottom trawls that target bottom-dwelling fish drag nets on the seafloor and can break, smash, and otherwise damage deep-sea corals and other marine life. These coral communities can take many years to recover, and coral damage can significantly affect organisms in surrounding ecosystems, particularly fishes that depend on corals for essential habitat for shelter, feeding, and reproduction. Research documenting the impacts of different fishing methods on seafloor habitats has found corals to be particularly vulnerable. For example, in 2007 Mark Hixon of Oregon State University and I published a study off the Oregon coast that showed that fishing using bottom trawls reduced the abundance of sea pens by 99 percent and decreased the overall abundance of benthic invertebrates by 55 percent (Hixon and Tissot, 2007). Other studies from around the world have yielded similar results, and many nations have taken steps to provide protection for habitats where deep-sea corals occur. In the last decade conservation of deep-sea corals has also been emerging as a high-priority policy issue in North America. In 2005, the Bottom Trawl and Deep-Sea Coral Habitat Act was introduced into the United States Congress. This would have temporarily banned the use of mobile bottom-tending fishing gear in unstudied areas until research determined whether deep-sea coral ecosystems are present, and would have permanently banned the use of mobile fishing gear in Coral Habitat Conservation Zones where deep-sea coral ecosystems are known to exist. 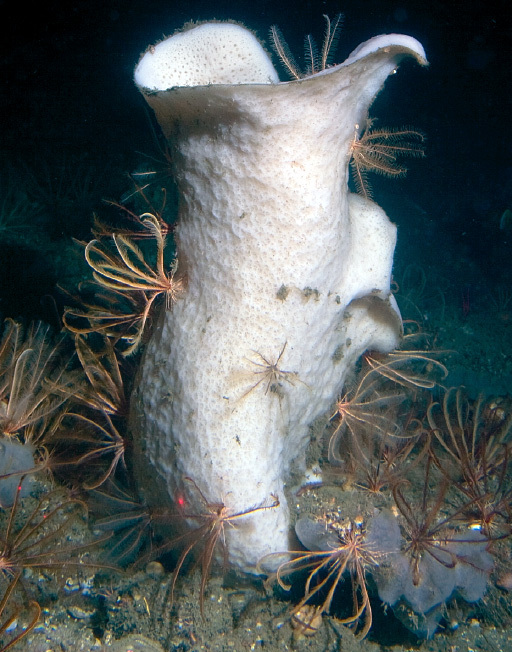 Although this act did not pass, the next year Congress did provide protection for deep-sea coral habitats by amending the reauthorized Magnuson-Stevens Fishery Conservation and Management Act which authorized research on deep sea corals, identify essential fish habitat, minimize by-catch of these species by trawling, and allowed the inclusion of coral and sponges in fishery management plans. Also in 2005, NOAA Fisheries closed nearly 400,000 square miles of the North Pacific Ocean surrounding the Aleutian Islands of Alaska to destructive commercial fishing. These areas included spectacular deep-sea coral and sponge gardens. Similarly, in 2006, NOAA Fisheries approved a plan to establish and protect more than 130,000 square miles of marine waters off the West Coast of North America as essential fish habitat for commercially valuable bottom fish. Within much of this area the plan prohibited fishing methods—such as bottom trawling—that can cause long-term damage to the ocean floor. 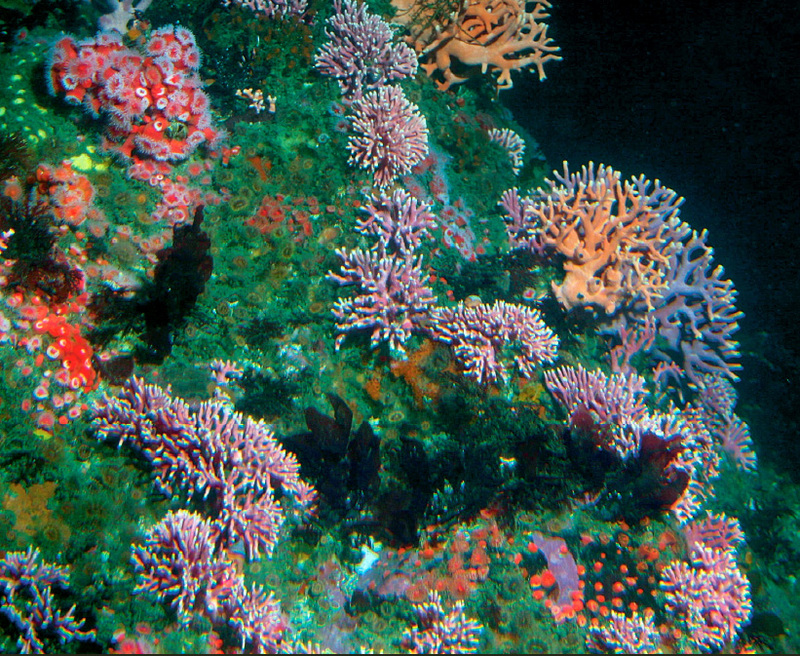 During this same period both the North Pacific and Pacific Fishery Management Councils proposed and adopted fishery management plans that provide protection for deep-sea coral habitats. In the two decades since my first dive, ocean management has clearly improved, but we are still just beginning to understand and protect these valuable deep-sea habitats. Currently there is insufficient protection—and it is not keeping pace with the rapidly expanding exploitation of marine resources. In the past decade, fishing trawlers operating in the open seas in international waters have had devastating effects on deep-sea coral habitats. Protecting these areas, to be successful, requires both increased awareness and international cooperation. Thus, in addition to more research on deep-sea corals, which will no doubt reveal some surprises, we need to spread the word about these fantastic organisms and their critical importance to sustaining healthy fisheries and maintaining the oceans’ productivity. Deep reefs form a physical structure on which many other species can live, often with one species finding refuge in or on another. Feather stars on a vase sponge, photographed by Rick Starr. 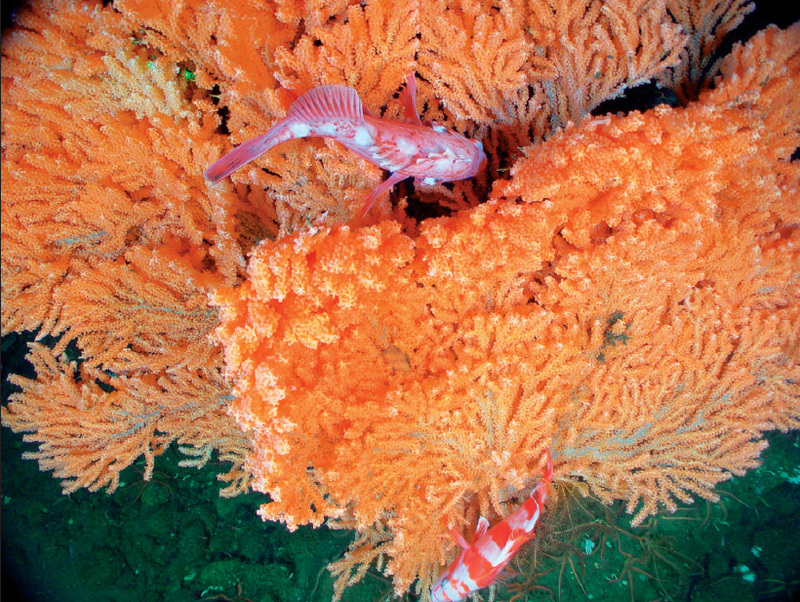 This article was edited and updated from “The Importance of Deep-Sea Coral Communities” published in Wings Magazine, a publication of the Xerces Society for the Conservation of Invertebrates, Spring 2008.